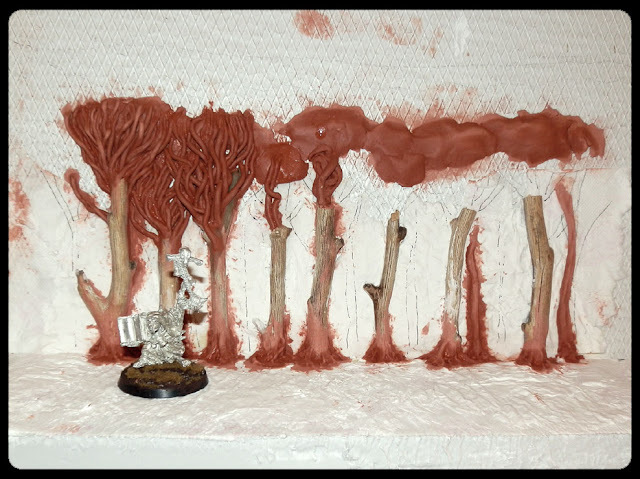 I've been asked more than once about how I made the photo background I've been using with my Cult of Vvolos miniatures. I took WIP photos at a few different stages in case I wanted to make a tutorial, and it turns out there is a demand for one. So let us begin. 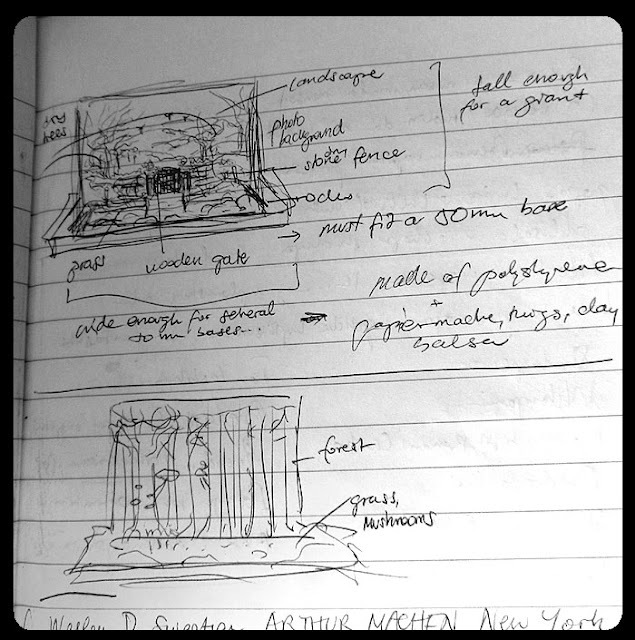 As is usually the case, the project began as a sketch. I actually had two ideas, as you can see in the above image. The forest version ended up getting made this time. The other one is more complex and I think it would be even more effective. There is nothing stopping me from making another one, so I expect that at some point I will. 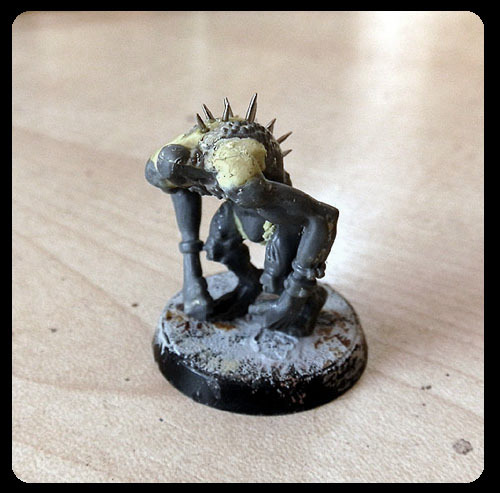 When deciding on the size for this thing I tailored it to my own needs - I mean to use it for photographing small warbands and single figures, and the largest of them will probably be the giant I have planned for later. Whatever you mean to photograph, make sure your background is large enough to accommodate it. The body of the background are two pieces of polystyrene. I only had at hand sheets that have a patterned texture on them. It would have been better if I had smooth ones because this way I had to get rid of the texture first. I experimented here with papier mache and plaster but I should have just sanded the surface until it was smooth. I suggest you do just that (if you are using textured polystyrene sheets). 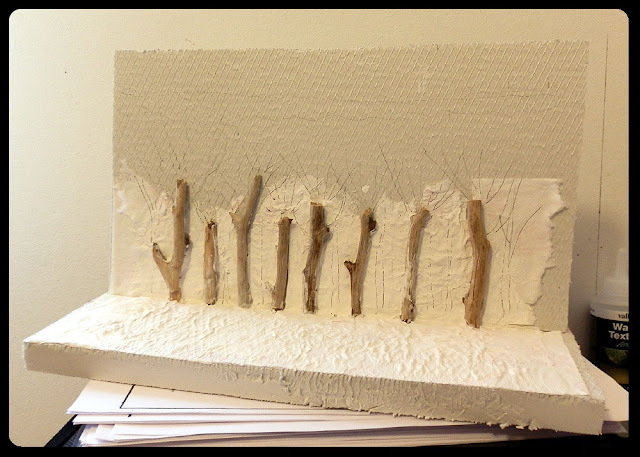 I added dry twigs I found in the woods to act as trunks for my miniature trees. When the previous step got dry it was time to break out the DAS air drying clay and get sculpting. 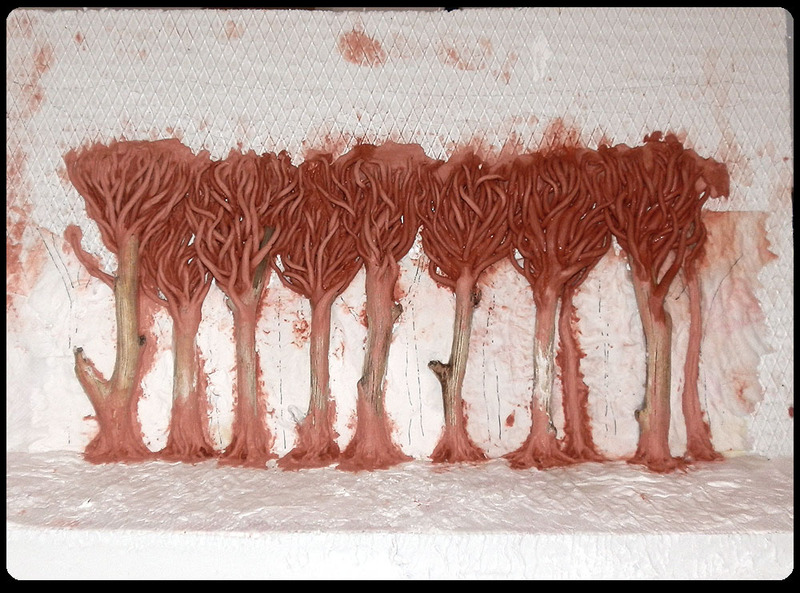 The trees' roots and branches took shape. Took me a while to make all the branches. I went for this weird alien look, but realistic trees could also be easily made this way. Another way to do this, with much less clay, would be by using real tree roots you collect on a hiking trip. When the clay cured I added some polystyrene rocks and sand on the ground. I used plaster to fill some holes between branches and further blend the bits together on the trees. 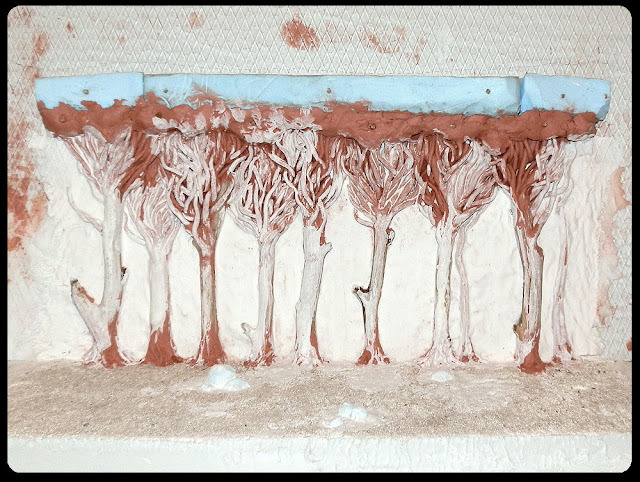 There is also polystyrene added on top of the trees to make the base for the leaves. After this I could start painting. 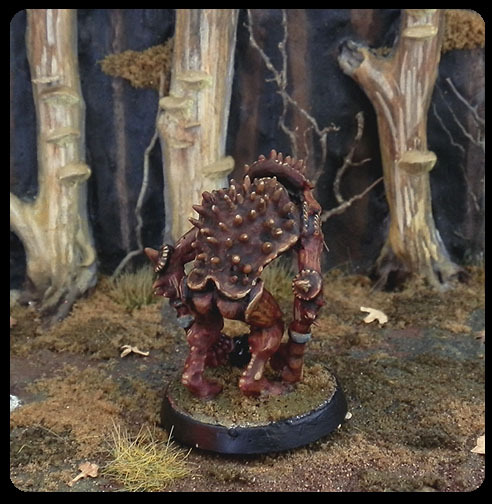 I painted it and textured it with basing products so that it matches the bases on my warband. As you can see above, I didn't bother with any part of this object that will be cropped out of photos when I use it. There is really no need for out-of-frame parts looking presentable because nobody will be able to see them anyway. That's it. It's not too difficult to make something like this, and it really helps give context and atmosphere to figures you photograph on it. I'll definitely continue using mine and make more such backgrounds to add variety and interest. 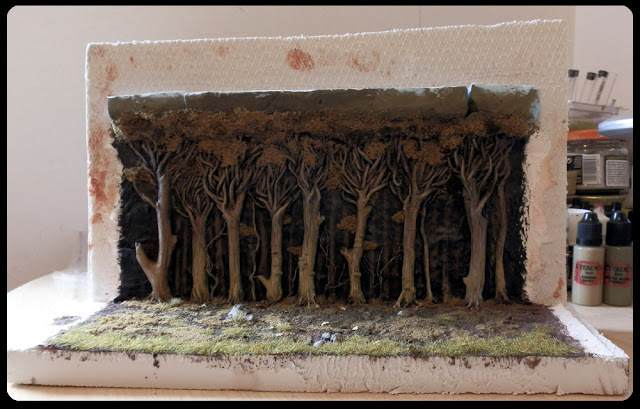 If you're new at the blog and wish to know more about how I make scenery I suggest you take a look at the posts labelled Cemetery Project and Wilderness Project. 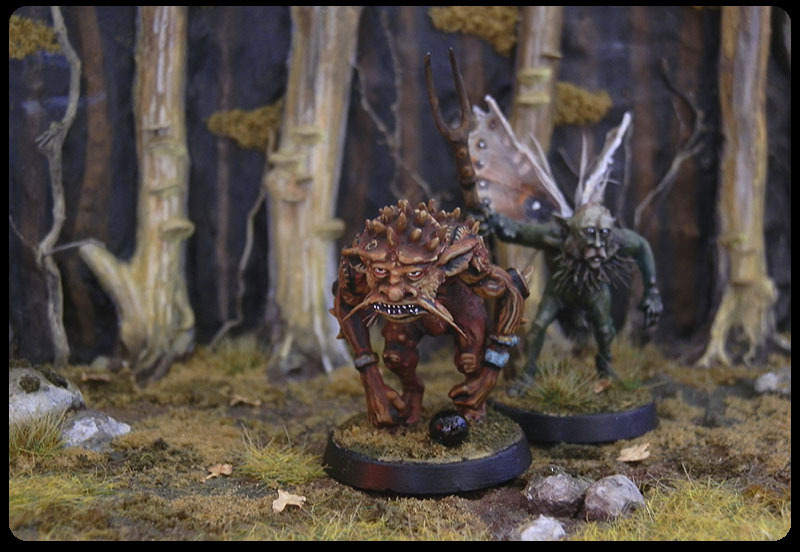 Urion's Daemon and his elder brother Okko. 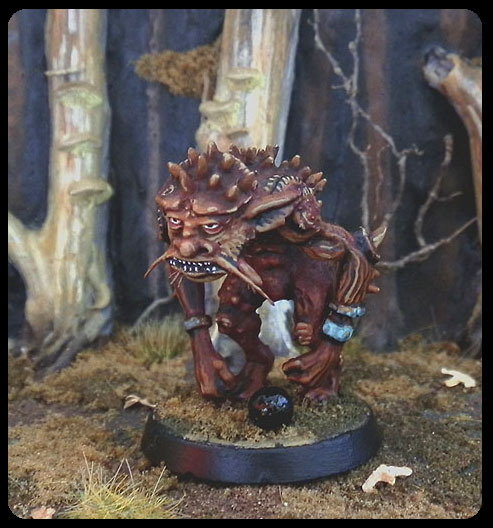 I took a commission to convert and paint a daemon similar to my recent offering Okko. I was given nearly complete freedom with it, which is wonderful (and not typical in my own experience with working commissions so far). Urion, the client, gave me a couple images to demonstrate what sort of look he would like. This Miller piece immediately caught my attention, so we agreed I would make something like the critter above. 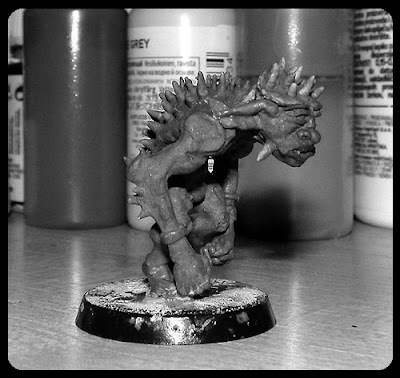 I went with a different colour scheme, which, now that I look at him, gives him the look of Akki goblins from MTG. I started with Bloodletter torso, Horror arms and Plaguebearer legs from my bits box. 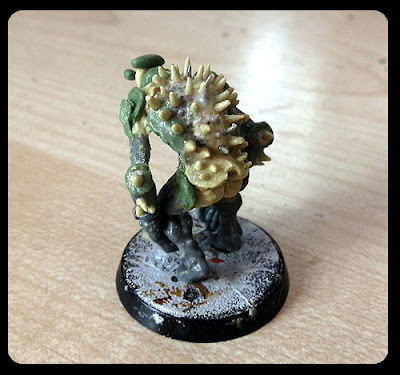 Once these were properly connected, I sculpted the rest with green stuff and Milliput. The back was the most fun part for me. This is at a very late stage of converting. The head was the last thing I did, and the most difficult. The painting was done in one sitting. It often happens when I paint a conversion; I just can't wait to see how it will look in the end. What a great dark climate! love it! Wonderful! Thank you for the trip behind the curtain with this tutorial. 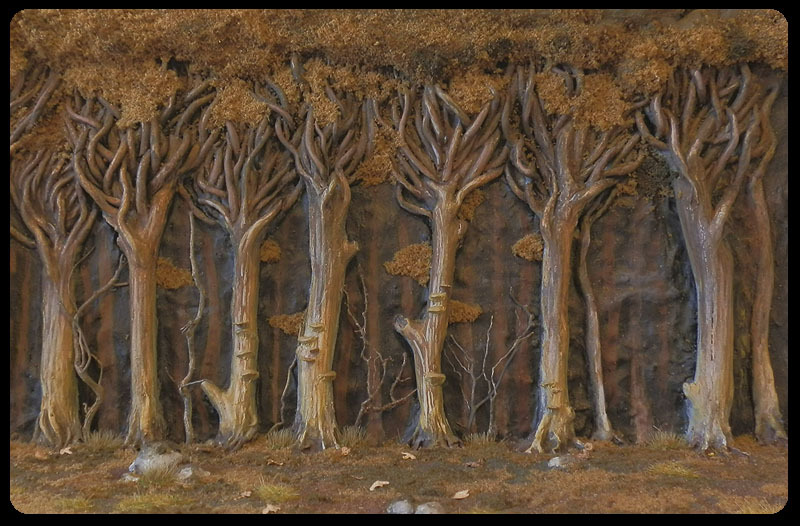 Natural branches might have worked but your fanciful sculpt and painted trees in the background give the backdrop a dreamlike quality making it that much the better. Wonderful tutorials. One of my favorite things about the daemon is his whiskers. You did a great job on his face. I also really like his shell. In some ways he reminds me of a Japanese Kappa. 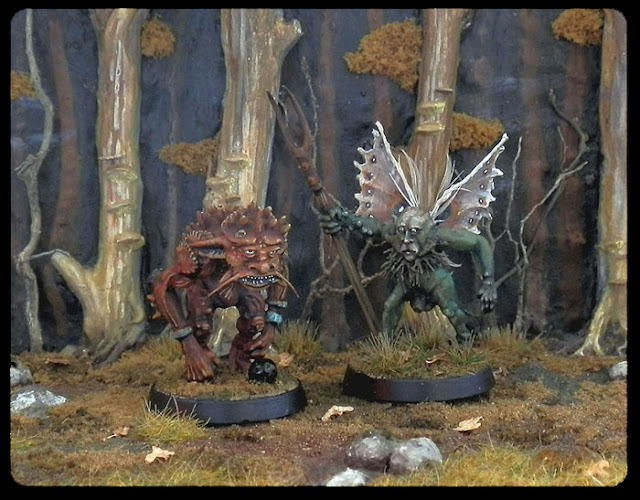 Cheers for the how-to and that demon is just excellent from the look on his face to the colours and everything. Wow Ana, that daemon looks amazing! Like it walked straight off of one of the pages of a Jim Henson sketch book! Bravo! A very useful tutorial, really. Thanks for listening to our requests. Utterly superb - as is this entire blog! The understatement of these demons makes them all the more diabolical, somehow. I love the butterfly-like wings and whiskers. 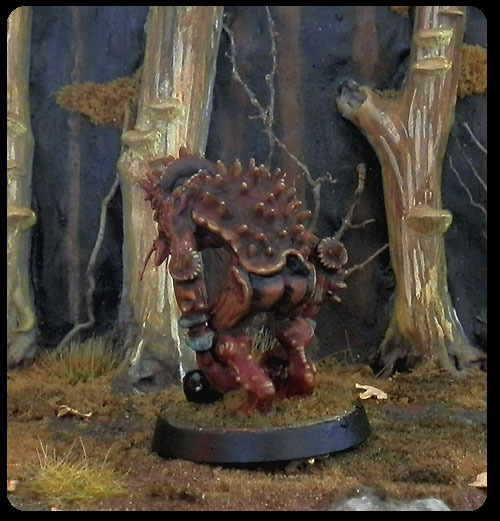 That's an amazing conversion, and a lovely background. Too awesome, live the tutorial. He looks like a Conker Demon! Fantastic realisation of Ian Miller's work. I'm also loving that background piece - I'd really like to try to make something like that some day. Makes your photos so thematic and have lots of interesting depth. Thank you for sharing your thoughts, everyone! That's amazing on so many levels. Very creative indeed and definitely gives me food for thought on how to improve my own projects. Love that demon. great stuff! Thank you Monster and Kym! 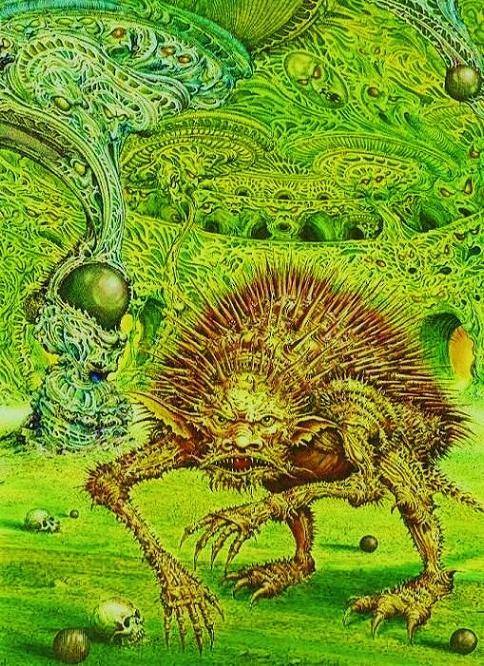 What are the dimensions of this? I'm thinking about making something similar and I don't want to get the sizing wrong.